If you've somehow managed to miss all of the great many Assassin's Creed: Unity trailers that Ubisoft has been throwing around lately (like this one, and this one, and this one), fear not: The new Assassin's Creed: Unity 101 trailer covers it all. 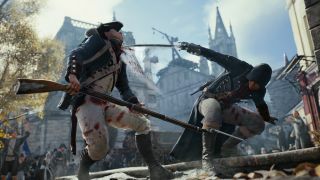 At a little over seven minutes in length, the new video touches on just about everything, from the huge Parisian crowds enabled by next-gen technology to the improved, more "nuanced" combat, appearances by famous historical characters like Napoleon and the Marquis de Sade, and of course the new co-op multiplayer mode. And since we're way beyond worrying about spoilers at this point, it's safe to say that it also highlights Arno's surprise trip through a "time anomaly" to Paris during the Second World War, where he'll climb the Eiffel Tower and blast away at German fighters. As promotional videos go, this one is pretty comprehensive, but I wouldn't expect it to be the last: Assassin's Creed: Unity doesn't come out for another week—November 11, to be precise—and that's plenty of time to squeeze in at least one more.